HOUSTON, June 18, 2018 /PRNewswire/ -- DISH is advancing in-room entertainment by integrating Netflix into its EVOLVE® television solution for hotels in the coming months. Guests staying in hotels powered by EVOLVE will be able to access their personal Netflix account directly from their room's TV. DISH is the first major pay-TV provider in the U.S. to integrate Netflix into a customized TV solution for the hotel industry. In addition to Netflix, EVOLVE provides access to thousands of Android TV apps from the Google Play Store, further enhancing the overall in-room experience. Launched in June 2017, EVOLVE is DISH's 4K-capable hospitality set-back box that seamlessly integrates Chromecast, streaming apps via the Google Play Store, live linear content, the industry's best interactive programming guide, and now Netflix into one customizable solution. Powered by SMARTBOX®, DISH's revolutionary headend video distribution platform for commercial applications, EVOLVE is designed to work with any hotel wiring scenario, as well as existing or upgraded network infrastructures. "Integrating Netflix on EVOLVE is a win-win for hotel operators and guests alike," said Alistair Chatwin, vice president of DISH Business. "Hotel operators can further elevate in-room entertainment by providing guests with Netflix's personalized entertainment experience, and customers can easily pick up what they've been watching at home on Netflix from the comfort of their hotel room." "With DISH's EVOLVE, Netflix members can sign into their Netflix account on the hotel room TV in the coming months to watch their favorite Netflix series, documentaries and feature films, or discover new ones, just like they do at home," said Paul Perryman, vice president of business development at Netflix. "Hotel guests who don't have a Netflix subscription can easily subscribe via the Netflix app on EVOLVE and immediately begin enjoying titles from our wide assortment of content." Because EVOLVE is 4K-capable, guests can watch Netflix's suite of 4K movies and shows, bringing the clearest resolution to in-room entertainment. This content is accessible when EVOLVE is connected to a 4K TV. 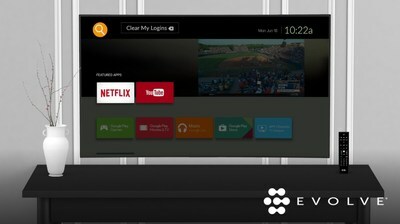 Guests staying in hotels powered by EVOLVE can subscribe to Netflix or sign into their existing account by accessing the Netflix app via the on-screen TV menu. EVOLVE features Chromecast built-in, so guests can also cast their Netflix content from their mobile devices to their hotel room TV. When the guest checks out of the room, their Netflix user credentials will automatically be removed from the system. Netflix will be available on EVOLVE in the coming months. To learn more, visit www.dish.com/evolve or visit the DISH booth (#1139) at HITEC in Houston from Tuesday, June 19 through Thursday, June 21. DISH's SMARTBOX™ features the flexibility to support a custom combination of legacy analog and HD channels at the same property, while easily reconfigured to meet future expansion and technology needs. By enabling new feature downloads via satellite, SMARTBOX can support the latest upgrades without the need for new equipment. With a compact form factor, SMARTBOX takes up considerably less space and uses significantly less power than other solutions.